Whether you are buying part(s) for your vehicle, or are in the repair business, we are one of the top service oriented and premier salvage yards in the Burlington, Vermont area. We buy junk cars, recycle scrap metal, sell used car parts, and even offer towing services! Rathe’s offers quality used automotive parts for most foreign and domestic vehicles. We even have some in “later” model vehicles so we are able to fulfill most requests. We have knowledgeable, friendly, and courteous staff that are eager to help you with all of your requests no matter how small or large task might be. Our highly trained staff that are able to provide the most accurate description and knowledge of the part you are inquiring about. Ever wonder how to pronounce our name?… Well to be honest you are not the first, we are used to it! Rathe’s is pronounced “Ratty’s” and it’s as easy as that! 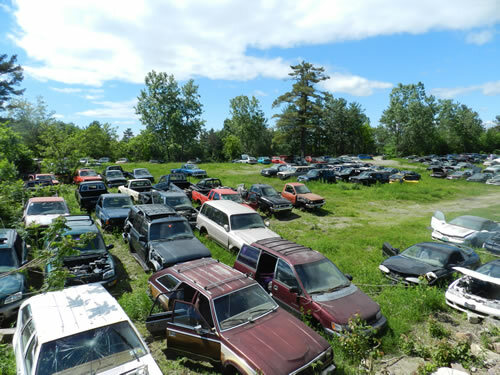 Our salvage yard sits on 20 acres abutting Interstate I-89 in Colchester located minutes from Burlington. Come on down as we are looking forward to seeing you.